100$ Instagram Journey - Elites May Giveaway. CPA Elites - CPA Marketing Forum CPA Marketing, Help Desk And Experiences Case Studies, Journeys & Bragging 100$ Instagram Journey - Elites May Giveaway. This is my first journey.I started IM in 2008 and work on different network and currently I am working with cpagrip one of the best network for CPA. 4.Target 100$ day till end of month. I will update this thread daily.If you have any question and suggestions than you can shoot here. (2016-05-14, 02:59 AM)iupdpcvm Wrote: Goodluck with your journey! how many accounts per proxy do you use? how many follow per day? (2016-05-14, 11:27 AM)denial21 Wrote: how many accounts per proxy do you use? (2016-05-14, 02:07 PM)ϟ★ --- The previous Admin --- Eye★ϟ Wrote: Subscribed, thanks for taking part in the giveaway. 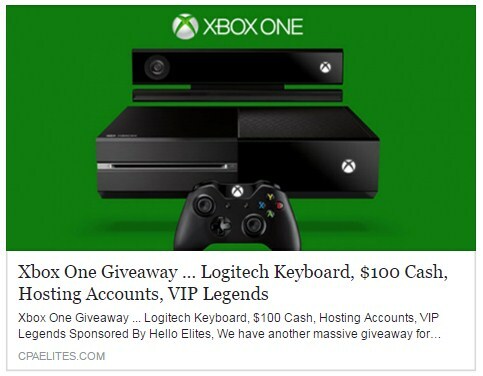 Make sure you go and post this thread including the social share screen shot as instructed on the giveaway thread: /Thread-Xbox-One-Giveaway-Logitech-Keyboard-100-Cash-Hosting-Accounts-VIP-Legends it's important that you do this in order that we can submit you, if it's already done don't worry and good luck! are you using new accounts? because i tried like 600 follows and got banned the next day. Im using massplanner.